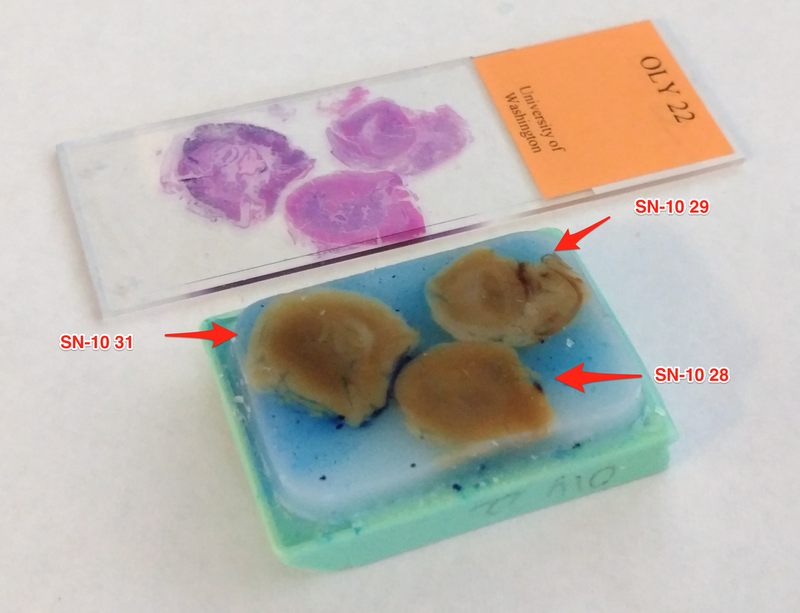 Isolated RNA from Olympia oyster gonad previously preserved with the PAXgene Tissue Fixative and Stabilizer and then embedded in paraffin blocks. See Laura’s notebook for full details on samples and preservation. RNA was isolated from the following samples using the PAXgene Tissue RNA Kit (Qiagen). 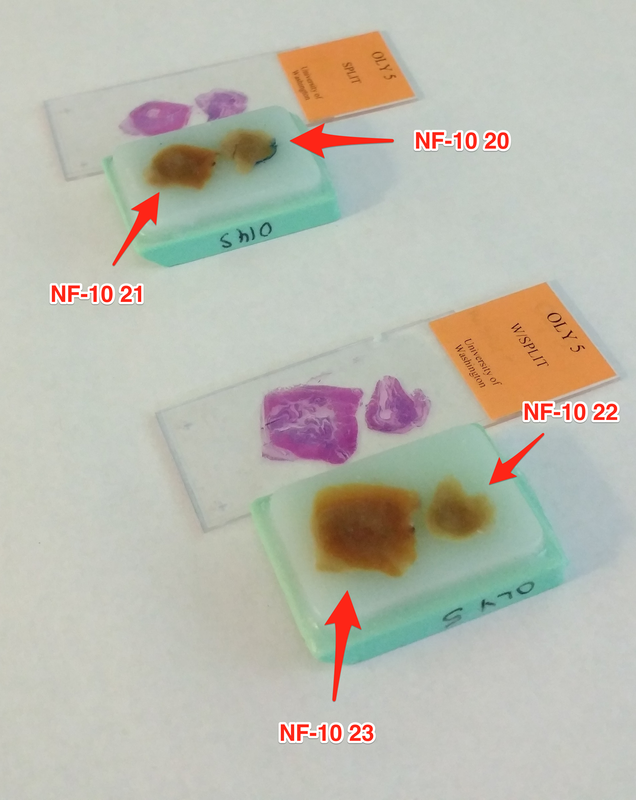 Gouged samples from the blocks weighing ~10mg from each of the tissues and processed according the protocol for isolating RNA from blocks of paraffin-embedded tissues. Prior to beginning, I prepared an aliquot of Buffer TR1 by adding 40μL of β-mercaptoethanol (β-ME) to 4000μL of Buffer TR1). Reconstituted DNase I with 550μL of RNase-free H2O. Aliquoted in 100μL volumes and stored @ -20C in the “-20C Kit Components” box. “Max speed” spins were performed at 20,000g. Tissue disruption was performed by adding ~25-50 glass beads (425 – 600μm diameter) with the Disruptor Genie @ 45C for 15mins (in the Friedman Lab). Samples were eluted with 27μL of Buffer TR4 x 2, incubated @ 65C for 5mins, immediately placed on ice and quantified on the Roberts Lab Qubit 3.0 with the RNA High Sensitivity Assay (ThermoFisher Scientific) using 5μL of each sample. Well, the good news is that there’s RNA from all the samples and it seems to be in relatively high concentrations! The bad news is that the concentrations for 10 of the 12 samples were too high and outside the range of the Qubit RNA HS Assay! Since we don’t have the broad range RNA assay, I can’t properly quantify the remaining samples. However, these samples are being sent to Katherine Silliman at some point, so I’ll leave it up to her to quantify the samples. I’m also guessing that she’ll run them on a Bioanalyzer to assess their integrity prior to beginning library construction, so that will also yield concentrations for the samples. Samples were stored at -80C temporarily. Samples will be sent to Katherine Silliman for high-throughput library construction and sequencing once I hear back from her regarding her availability to receive the samples. Received notification that the samples sent on 20150601 for RNAseq were completed. Made a readme.md file for the directory. I prepared fresh Buffer TR1 + β-mercaptoethanol (β-ME). Five 5μm sections were taken from each block. A new blade was used for each block. Samples were then processed with the PAXgene Tissue RNA Kit in two groups of six. Well, these results are very consistent with the data from the last isolation performed on these samples. This fact suggests that the problem lies with the tissue samples and not the isolation (since the isolation has been performed two separate times on these same samples and the results have come out virtually identical both times). 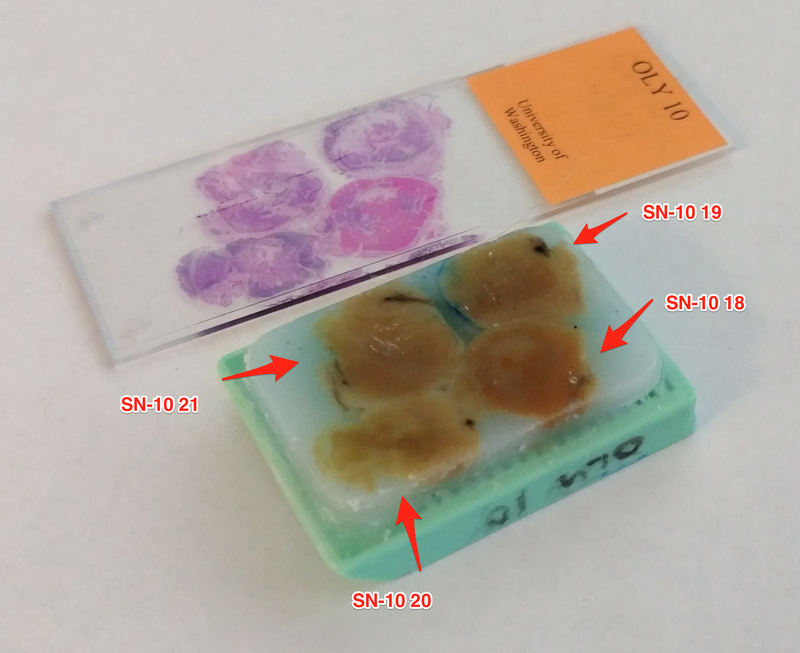 Will discuss with Steven, look at Grace’s notebook to review the preservation process for these samples, and review the PAXgene Tissue RNA Kit to see if it will accommodate a greater number of microtome sections to use for isolation. 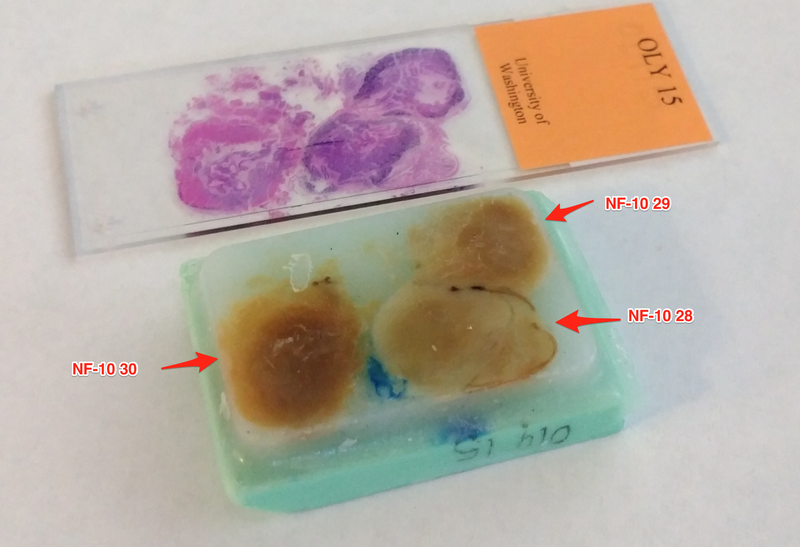 Isolated RNA from geoduck gonad previously preserved with the PAXgene Tissue Fixative and Stabilizer and then embedded in paraffin blocks. See Grace’s notebook for full details on samples and preservation. I used Buffer TR1 + β-mercaptoethanol (β-ME) prepared on 20150408 for samples 02, 03, 04, 07. 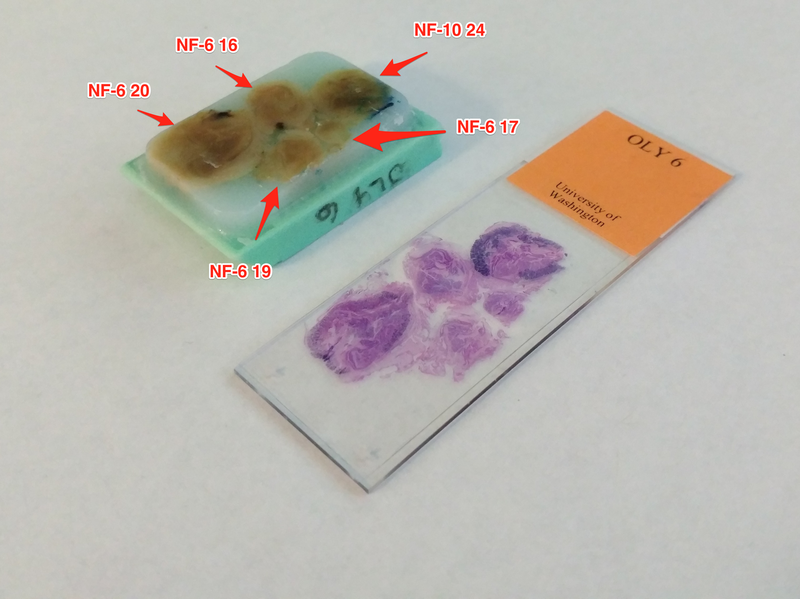 The rest of the samples were processed with buffer prepared today. 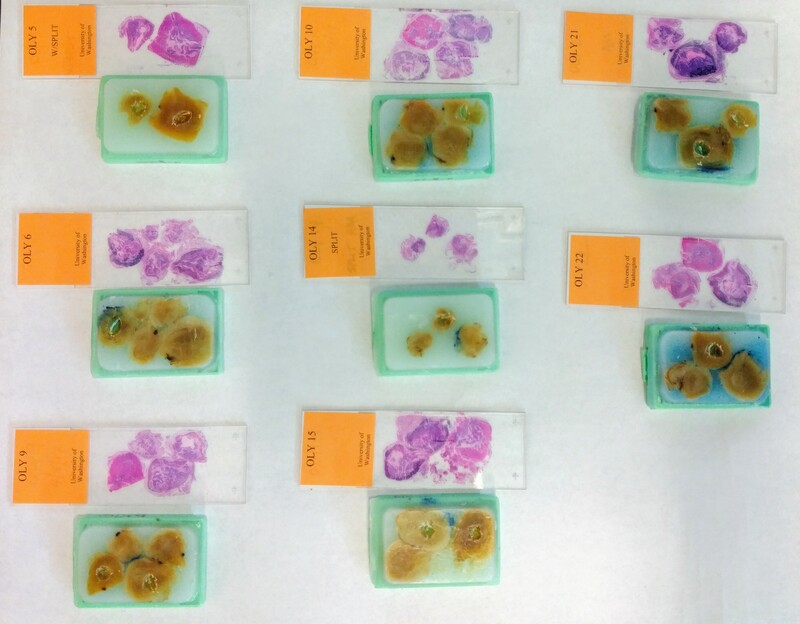 Samples were then processed with the PAXgene Tissue RNA Kit in two groups of eight. Well, these results are certainly not good. The first set of eight samples I processed yielded no RNA (except #38, which is only marginally better than nothing). All the samples (excluding #38) have been discarded. 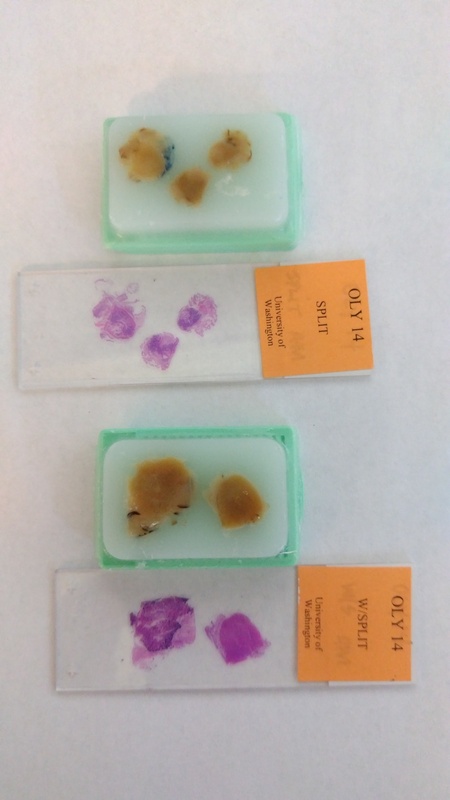 The second set of eight samples I processed range from amazing to poor (#68 was barely worth keeping). I’ll review the protocol, but at the moment I’m at a loss to explain why the first set of eight samples came up empty. Will perform another on these blocks on Monday. Grrrrr. 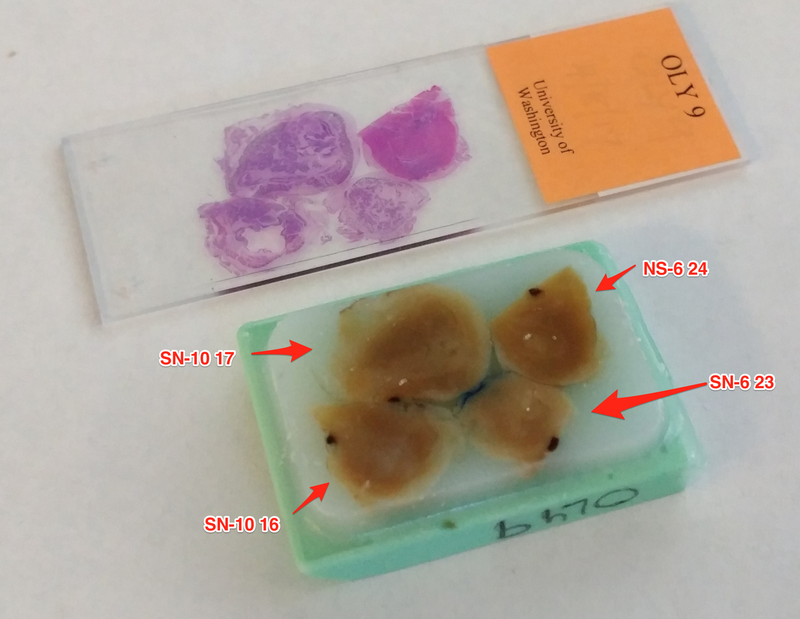 Samples were stored at -80C in Shellfish RNA Box #5. Jesse will determine if the samples should be run on the RNA Pico or the RNA Nano chips.